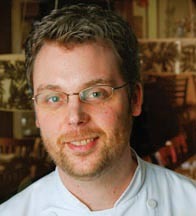 Chef Sean Sanders was born and raised in Chicago and its surrounding suburbs. About 15 years ago he graduated from the Cooking and Hospitality Institute of Chicago (CHIC). Since then he has worked at some of Chicago's premiere restaurants including Green Dolphin Street, Rhapsody & Atlantique, to name a few. For a short time Chef Sanders even started his own catering company before landing at Bin 36 where he worked as Sous Chef at both the downtown location and the wine cafe in Bucktown. Browntrout was created by Sean And Nadia Sanders while honeymooning in New Zealand.As we traveled through New Zealand we realized how sustainable their lives are compared to ours in The United States. We went fishing in the glacier waters of Lake Wanaka in Southern New Zealand. We caught a Brown Trout. We took it back to our cottage and cooked it up with things from the land. Fresh English Peas, walnuts from the trees, shallots & potatoes from the ground with fresh mint…. As we were enjoying our meal, the wheels began to spin and we thought of how we could do this in Chicago. "Fresh & sustainable ingredients put together in an elegant yet simple fashion." Upon return he went to work to find the perfect location to open his restaurant. It had to be somewhere easily accessible without all the downtown hype. He wanted to have enough space to fulfill his vision of a comfortable dining, enough kitchen space to create as much of the menu preparation in-house as possible & enough space to grow all his herbs in an on-site garden. He finally found it. Today, together with his wife Nadia, he operates Browntrout and everyone can share in his vision... Browntrout opened in May 2009. The name refers to the sustainability of a Brown Trout. They are in lakes and rivers all over the world and will not be commercially fished or farmed. "Swim Brown Trout, eat Browntrout."